There's absolutely no way I can be sad this Friday -- the turnout for my Pumpkin Patch Crochet-Along has been AWESOME so far and it's my birthday/anniversary weekend! 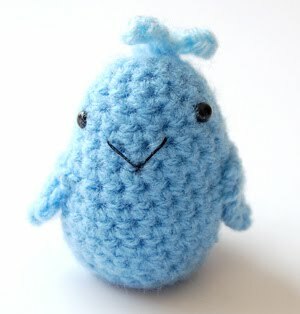 But, as I was looking through the Flikr group for some great amigurumi to feature, I couldn't help but notice all of the beautiful pieces in blue -- so this week's Feature Friday theme just had to be "The Blues." Let's go have a look, shall we? The first thing that caught my eye was this super-cute blue whale by AmiEggs. You may remember her super cute sofa pattern that I featured on one of my first Feature Friday spots... well, in the mean time, this Spanish amigurumi designer has been cranking out adorable eggs with every kind of personality you could imagine! 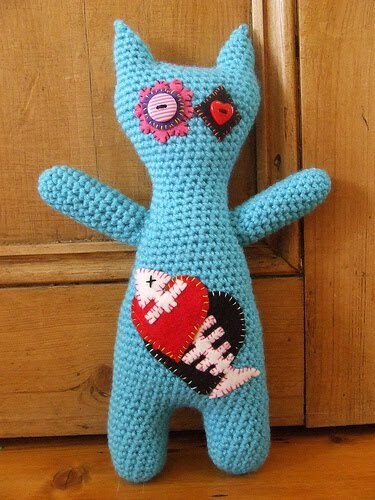 The next thing that caught my eye was this ultra-cool cat design by Heather in the UK (aka "The Happy Wool Junkie"). I absolutely LOVE the detail on the felt applique (making me wish I could applique with something other than glue!) Heather has also done a bunny and a black cat (both totally awesome). If you want to see a shot of the three of them together, you should check out her blog! 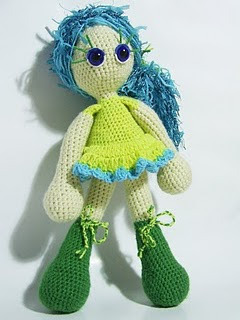 One of the latest additions to the group was a starry-eyed doll with a shock of blue hair named Vivi. The creator, KooKoo Crafts, doesn't list a home country, but there's a lot of Slovenian on her blog -- so perhaps a resident of the Republic of Slovenia? Wherever she's from, her blog is filled with brightly-colored crochet and is a real delight to look at and her dolls are really inspiring! Remember, if you want to be featured in my Feature Friday series, check out the Share Your Work tab at the top of the page. And if you have been featured, you can grab a blog badge on the same tab to show off! Well, I'd better get a move on! I've got wool to wind and a few pumpkin experiments to work on this weekend before the crochet-along gets into full swing. And, if you haven't signed up to join us -- it's not too late! Just check out the introductory post for all the details! Today was great, but being featured on your blog is the best thing that happened :) Thank you so much for this and all the nice words about my dolls. And yes, I am from Slovenia and you would make a great detective ;) Thank you so much once again! 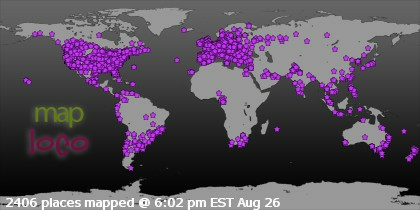 I love seeing everyone's awesome work, great job my fellow crocheters!